One-of-a-kind Expanded Rockwood ranch model features premium, private location backing to woods with a 42' wrap-around patio featuring a new maintenance-free railing and huge retractable awning. Highlights include hardwood floors, volume ceilings throughout and plenty of rooms to meet all your needs, including a walk-up attic for lots of storage. The eat-in Kitchen features granite counters, tiled backsplash, updated cabinetry, hardwood floor, and pantry. Formal Living and Dining Rooms also both feature beautiful hardwood floors. 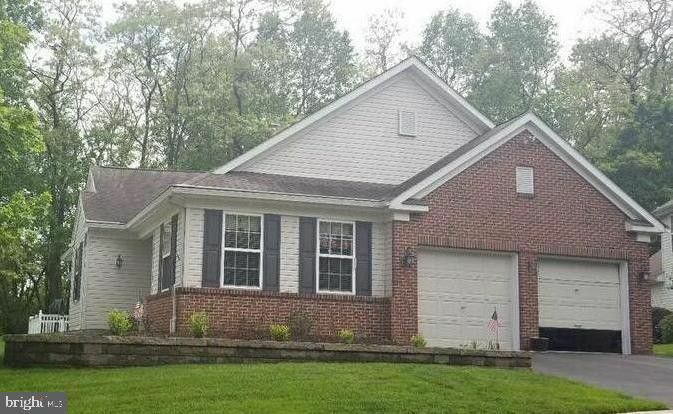 Spacious Family Room has a cathedral ceiling and is open to a terrific 35' bonus room/sunroom addition, easily divided for a 3rd bedroom or office. Tiled Main bath has luxurious whirlpool tub and linen clos. Worth Noting: New, Upscale Hardscaping in front yard, New Gutter Guards, handicap access from garage ramp into the house. Wonderful country-club living in the Villages of Flowers Mill features awesome clubhouse with fitness center, game rooms, ballroom, indoor and outdoor pools, tennis and bocce. Activities for every interest. Ideally located near shopping, restaurants, medical facilities, and easy access to I95, Rt. 1, and PA Trpk. Terrific home and terrific lifestyle!